Manchester United's season so far has been nothing short of inconsistent. The Red Devils find themselves in 8th place on the Premier League table with 13 points, having won just 4 of their 8 league games so far. 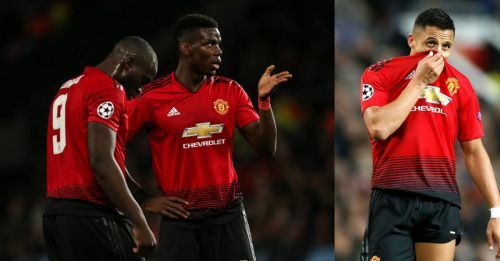 The club seems to have more than its fair share of troubles and in an interview with ESPN (via The Sun), Manchester United legend, Paul Scholes, tore into and blasted 3 players in particular - Alexis Sanchez, Romelu Lukaku and Paul Pogba. The three players together reportedly earn close to £1 million per week, but have failed to truly shine. Alexis Sanchez and Romelu Lukaku arrived last season, but continue to be plagued by inconsistency. Pogba, on the other hand, has made the news more often for his spat with manager Jose Mourinho, than for his performances. Speaking to ESPN, Manchester United legend, Paul Scholes, said that the trio isn't good enough for a team that aspired to win the Premier League title. “I never saw him as a United player. I saw him as a bit selfish, someone who played for himself sometimes. “I didn’t think he was a player that we needed, especially for that type of money. Next in Scholes' firing line was Belgian striker Romelu Lukaku. “I’m just not sure you are ever going to win the league with a goalscorer like Lukaku. I don’t think his play outside of the box is good enough. “I’m not sure if he works hard enough but he’s still a young man who has done well and scored a lot of goals. Scholes then targeted Paul Pobga with his incinerating remarks. “Pogba does some of the best things in games, a great pass or dribble, a great touch or dribble. “Then, five minutes later, he’ll do one of the worst things like his brain has switched off, like it’s all about him because he’s just shown everyone how good he is. “That becomes easy to play against because you know that cockiness will come. Scholes also revealed that his fear is that Mourinho's rotation of the likes of Anthony Martial and Marcus Rashford could see the uber-talented youngsters leave eventually. Jose Mourinho will have to pull a few miracles to put things back on track at Manchester United. It could be do-or-die time for the Portuguese tactician. Where will Alexis Sanchez play for Manchester United? What has happened to Alexis Sánchez at Manchester United?